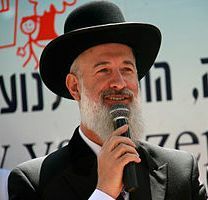 "I want to thank you for your support of Israel and in particular for waging a war against Iraq," Metzger told Bush, according to the chief rabbi's spokesman. Bush reportedly answered that the chief rabbi's words "warmed his heart". Metzger's stand on the Iraqi war reflects the Israeli majority. But in the United States, according to a survey of American Jewish Opinion, published last year, 70 percent of US Jews disapprove of the Iraq war, with 28 percent backing it. Metzger's comment can only have negative repercussions for Jews, who are already seen by a growing percentage of Americans as too influential on American foreign policy, and have already been accused of pushing America into Iraq.